Welcome to Classic Hawaiian Products, the #1 retailer of made-in-Hawaii clothing for you, your spouse, your children and infants! Have a question, call us at (808) 277-5323. Hawaiian dresses and Hawaiian shirts have been a time honored tradition in Hawaii. Many locals and tourists wear Hawaiian clothing because of their dressy, yet casual, appearance. Aloha Friday is when people in Hawaii show our aloha spirit by wearing aloha wear, such as an aloha dress or aloha shirt. To complement your Hawaiian clothing you should also make sure you have a decorative Hawaiian lei and consider family matching clothing. Hawaiian apparel is perfect for the tropical weather in Hawaii because it helps you stay cool and fashionable. No matter where you live, Hawaiian dresses, shirts, board shorts and sarongs are ideal to wear in the summertime or when traveling through hot climates. 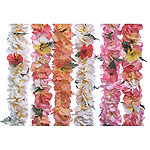 Aloha wear is essential when attending a Hawaiian Luau, Hawaiian themed party or Hawaiian themed wedding. 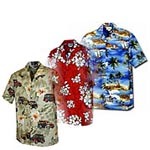 We have a huge selection of men's Hawaiian shirts, and many different styles of women's Hawaiian dresses and Hawaiian blouses to choose from as well as children's and baby's Hawaiian apparel, Hawaiian cabana sets and family matching clothing. 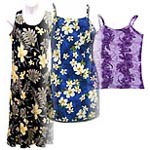 Cool and comfortable women's Hawaiian clothing & accessories. 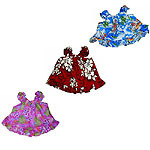 Women's Hawaiian dresses, shirts & blouses, capri pants, sarongs, board shorts and tropical handbags. Cool and comfortable men's Hawaiian clothing. Huge selection of men's Hawaiian shirts and shorts. Don't miss our limited Christmas shirts before they sell out! 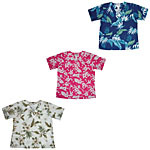 Cool and comfortable childrens Hawaiian clothing. 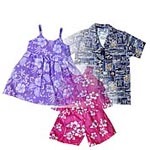 Girls' Hawaiian dresses, boys' Hawaiian shirts, toddlers' Hawaiian dresses and cabana sets. Cool and comfortable babies' Hawaiian clothing. Includes matching tops and diaper covers. Silk Flower Lei, Kukui Nut Lei and Silk Flower Accessories. Cool and comfortable medical scrub tops with fashionable Hawaiian aloha print patterns. Both men and women alike will enjoy wearing these bright and cheerful medical scrub uniforms.